That would be a good slow newsday headline, as hens don’t regularly lay two eggs in one day. It would be a topic that would spur lots of news punditry and social media debate. “Our investigations have revealed that the hen had probably been fed large amounts of hormone-laced feed,” an agricultural expert from The University of A&M State College said. “We must stop the inhumane practice of egg farming,” said a panelist representing an animal rights group. “Modern poultry feeds are a safe and scientifically proven method for farmers to economically get the most egg production from their chickens,” said a representative of the Poultry Producers Marketing Group. “Well, I’ll be…there’s two eggs in that nest,” said the farmer. “Cluck! 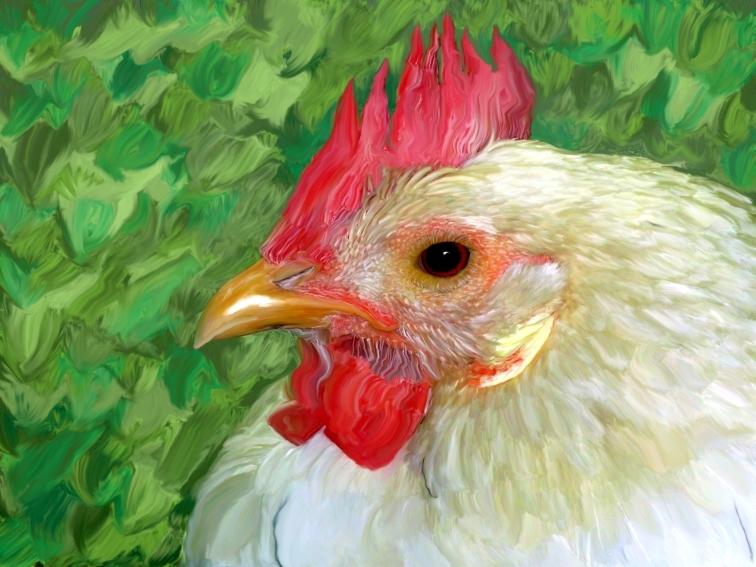 Cluck!,” previously said the hen during an interview on Oprah’s new show. “Cluck! Cluck!,” previously said the hen on an appearance on Late Night with David Letterman. “Cluck! Cluck!,” said the hen. “Let’s all remember that the chickens have free health care that is subject to government oversight,” said a double-double-junior-deputy-under-under-assistant-USDA-secretary. “Cluck! Cluck!” had said the hen, looking around for some more chicken feed. “I like fresh eggs,” said nearly everyone in the world: vegans, Jainists, PETA members, and some others excepted. The chicken, unused to all this attention had hardly known how to respond. “What do you think of the Middle-East situation? Fracking? Ferguson? The future of space flight?” hundreds of reporters had asked the newly famous hen, microphones thrust in its face with lights blazing. “Cluck! Cluck!” had said the hen into hundreds of electronic recording devices, her response being furiously printed onto a thousand steno pads by those who had never learned cursive at any phase of their education. Reporters rushed off to file their stories before their deadlines. Many of them were visual media reporters who stopped into their motor homes for a coiffure adjustment and some makeup prior to their broadcast. The world waited breathlessly on the story of the chicken, until finally, the sad report came in of the chicken’s demise. Dozens recoiled in horror as rumors of the decapitation of the Two-Egg Chicken circled around Froward, Mississippi. Unfortunately, the rumors turned out to be true. The chicken was purchased by Joe’s Diner in Froward, decapitated, and its body later dismembered after having all its feathers removed. The dismembered parts were put into boiling water and mixed with GMO flour dumplings and served to patrons of the diner. The owner of the diner, Joe, Jr., had no comment when reached by reporters other than to say that a bowl of chicken and dumplings was $4.99, with cornbread and sweet tea. Locals we talked to said that Thursday was Chicken and Dumplings day at Joe’s Diner, started by Joe, Sr., during the ravages of the great depression. The insensitivity of the diners toward the plight of the chickens was hotly debated in many forums on the Sunday news shows. One show even discussed the possibility that the whole chicken issue was merely a diversion by the administration to obfuscate other unpopular administration practices that were under investigation. Congressional hearings were held into the safe preparation of chicken and dumplings, with thousands of subpoenas issued, and hundreds of hours of testimony from various poultry experts, economic experts, food safety experts, and animal rights groups. Millions of dollars was raised in the form of government grants and donations to the Egg Marketing Board and the Poultry Producers Association, even after a lawsuit and counter-suit was filed by the two groups groups, each claiming authority over the issue.